You can read the entire article here, but this is my favorite excerpt from a recent Slate article about a beehive exposed during Hurricane Irene. But the vibe among these amateur beekeepers was bordering on hostile. As a city contractor made phone calls, several people in yoga clothes and a twenty-something cyclist with a moustache argued over who had spotted the hive first. A man in a beekeeping suit, sans hood, pondered preempting them all by scaling the wet, slippery tree trunk and snatching it, seemingly with his bare hands. It sounds like this entire argument could have been solved with a quick game of rock paper scissors lizard Spock. 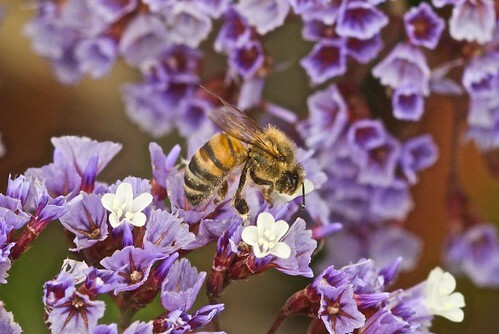 Austin area beekeepers have two upcoming meetings. These gatherings are a great way to meet local beekeepers, exchange ideas, and get your questions answered. 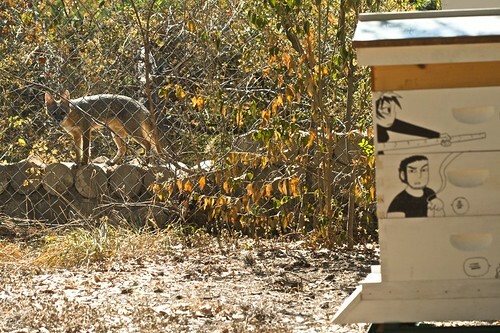 Marge and Knives have a bunch of new neighbors right next door to the their respective hives. Baab-Brock farms just added a new luxury chicken coop to encourage high density urban development in their downtown Austin area. Santa Monica is covered in bees! I just spend 5 days in Santa Monica visiting my brother and celebrating my birthday. After months of 100 plus degree weather in Austin, Santa Monica was a welcome respite, and it was amazing to see so many plants that are actually green and blooming. This drought in Texas almost made me forget what flowers actually look like. I’m sure being a beekeeper in Santa Monica has its unique challenges, but the bees were out in full force while I was there and had their pick of so many different types of blooms. I have no idea what this plant is, but the bees certainly were all over it. 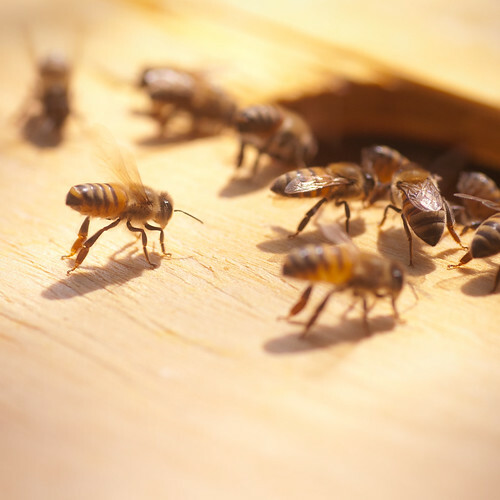 Here is a great link from a beekeeping exam about the bee waggle dance. I personally think the student should get full points for creativity. Since I haven’t hooked up AC to the hives, the girls will have to take care of the air flow themselves. 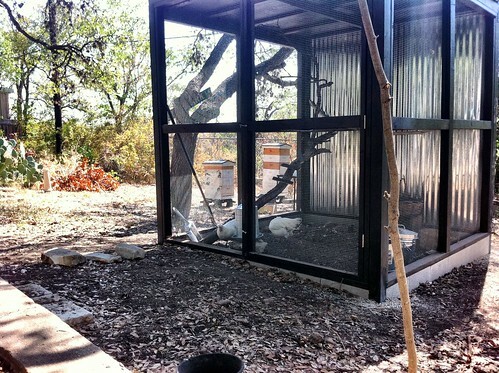 Below is a photo of fanning behavior to help regulate the hive temperature. 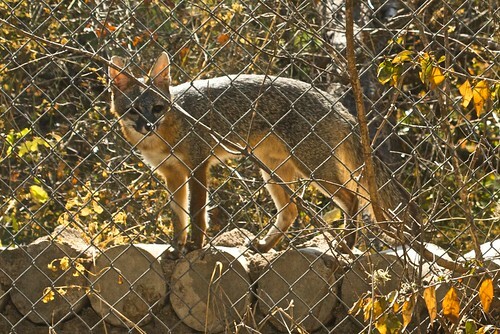 While I was suiting up to inspect Knives, a family of four foxes wandered up to the fence line of Baab-Brock farms. This area is known for its fox population even though it is within walking distance of downtown. We only managed to capture one of the four on film. Here it is admiring the ink work on Knives’ hive. I really wish we could have snapped a photo of the baby foxes, but they were hiding in the brush, and we couldn’t get a good shot. They were awfully cute though.